The Chiefs lost to the Broncos 24-17 on Sunday and had a chance to at least tie the game at the very end. Kansas City kept Peyton Manning off the field for an enormous chunk of the second half. The Broncos offense had only two drives after halftime (not including the final kneel down), one for a punt, one for a field goal, totaling just 8:51 in possession. The longest drive came from the Chiefs at the very start of the second half, where they ran 23 plays, taking 10 minutes off the clock... and ultimately missed a field goal. This got me thinking, how does drive length (in minutes) affect the probability of a team scoring? The Chiefs converted five third downs (essentially every spike you see in punt or touchdown probability). 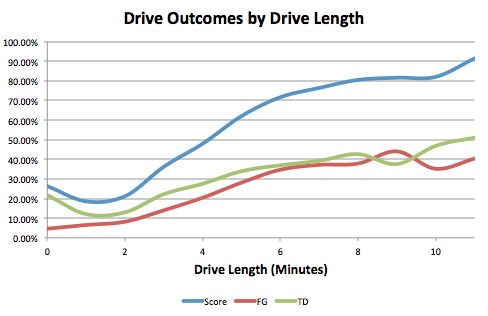 One would assume that as drive length increases, so does the team's chances of scoring (and scoring both a touchdown and field goal). The logic here is pretty simple -- there is a huge sample bias. Any drive that lasts awhile will most likely convert more first downs, gain more yards, and get closer to the end zone. The biggest exception will be drives starting in opposing territory. But, out of those drives starting in opponent territory, the longer drives will still be the more successful drives on average. As we expected, scoring probability increases dramatically as drive length increases. Knowing nothing else, at 10 minutes, we would expect the Chiefs to score 82.1% of the time (35.2% field goal, 46.9% touchdown). Using our Markov model, we can also show that once Kansas City gained a 1st-and-10 on the Denver 21, their probability of scoring never dipped below 75%. This was just meant to show how rare it is to come away with no points on such an extended drive. That being said, the Chiefs were able to stay in the game by keeping the prolific Broncos offense off the field. You can do the same analysis with drive length in plays, but it should come out extremely similar (0.88 correlation between drive length in minutes and plays). The biggest difference will be for those teams fighting from behind who are trying to move quickly, but still run a lot of plays -- or just general up-tempo offenses. 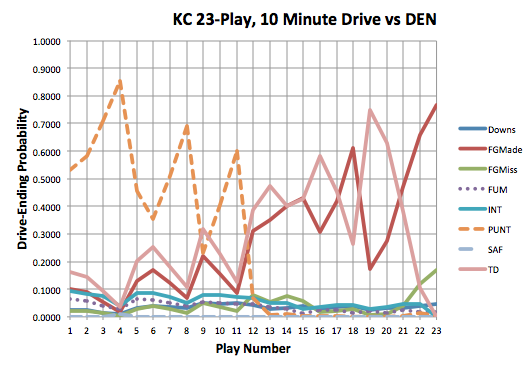 Last, the fact that John Fox did not use any timeouts on the Chiefs' last drive of the game is flummoxing. Kansas City had a 1st-and-Goal from the nine, down seven points with 1:45 left in the game. The only way that drive lasts longer than four plays is if there is an automatic first down penalty. If the Chiefs do not score, Denver wins anyway as the Chiefs only had one timeout remaining. If the Chiefs do score, you want Peyton Manning to have as much time as possible to allow the offense to get into field goal range. Denver held on to all three timeouts. If the Chiefs had scored on fourth down, Peyton would have had only had 18 seconds to do anything with the ball. Peyton with over a minute to get into field goal range leaves you with a high probability of winning the game. Peyton with 18 seconds most likely means overtime -- much closer to a coin flip. Safe to assume that in the endgame, smarter to take a timeout on defense than preserve for potential offense drive? The ability to go out of bounds, or throw the ball away, are virtual timeouts available to the offense that are not available on defense.